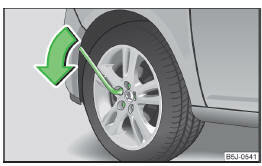 Push the wheel wrench onto the wheel bolt as far as the stop1). Grip the wrench at its end and turn the bolt about one turn in the direction of the arrow » Fig. 141. Grip the wrench at its end and turn the bolt against the direction of the arrow » Fig. 141 until it is tight. Undo the wheel bolts only a little (about one turn) until the vehicle has been jacked up. Otherwise the wheel could come off and fall down – there is a risk of injury. If it proves difficult to undo the bolts, carefully apply pressure to the end of the wrench with your foodt. Keep hold of the vehicle when doing so, and make sure you keep your footing.